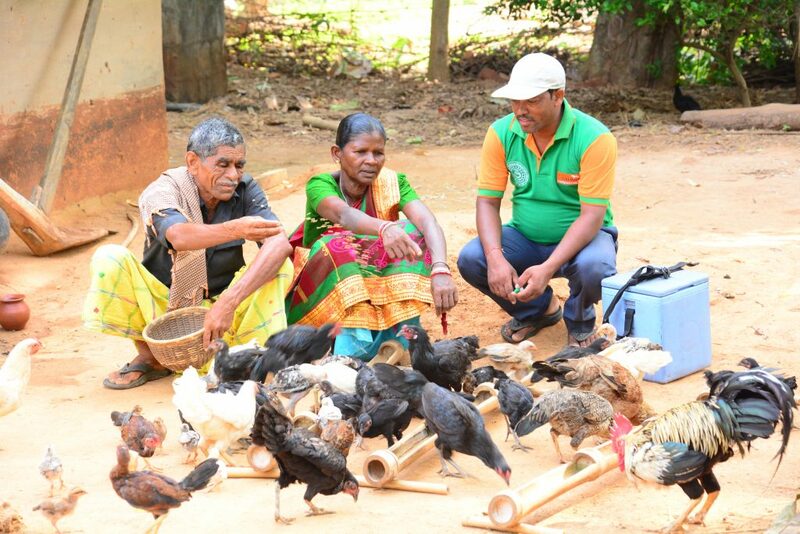 Access to a vaccine for Newcastle Disease (ND) has transformed the lives of communities in the Mayurbhanj district of Odisha state. Local inhabitants, who have traditionally bred poultry, would often experience the death of their flock during an outbreak of ND. The deadly disease has been known to kill entire flocks when an outbreak occurs. A vaccine against ND was introduced in this district with the help of the Bhodal Milk Producers Cooperative Society (BMPCS), an Odisha based NGO, which in turn was supported by the Global Alliance for Livestock Veterinary Medicines (GALVmed). The vaccine has played a key role in saving the birds and has contributed to increased income and intake of protein in families. Forty-six-year-old Jitray Marandi from Pandupal village is a farmer. He also rears livestock and gathers Mahua flowers, which are not only a food item for the locals but are also used for brewing country spirit, locally called Mahuli. He first heard of the vaccine about two years ago from Govardhan Naik, the local vaccinator and rural health worker. Having witnessed the death of his chickens year after year, he was keen to try anything that would stop the outbreaks. Marandi’s decision to try the new vaccine paid off. His chickens went almost unscathed after administering the vaccine. Over the past year his flock has grown to an impressive 100 chickens. Out of the 100, his family consumed thirty, while another thirty have been sold off providing much needed income. “I will use forty birds for breeding over the next year,” he said. 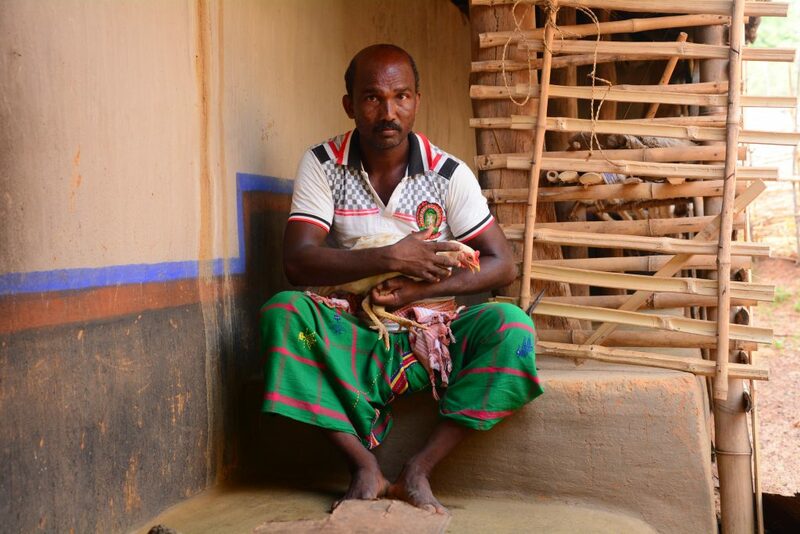 Poultry are very important to these communities who have reared them for generations, and are still rearing them. Not only are they a regular fixture in their diet, but they are also a means of income. Moreover, the chickens are also used as offerings in important religious rituals. It is not uncommon to see visitors bringing their own chickens and presenting them to the hosts as gifts. “My family has traditionally kept poultry, but they were always very few. The Ranikhet disease [local name for ND] wouldn’t allow the flock to grow,” says 60-year-old farmer, Gopal Hembram. Before the arrival of the vaccine for ND, they had no idea that their poultry could be protected medically. “We only got to know of this from Govardhan and the awareness videos we were shown,” Mr Hembram said. Since the introduction of the vaccine two years ago there has been no major outbreak. The flock size has increased from between a paltry two to six to 60. Adoption of the vaccine has also been very good, as the selling price of a single chicken is enough to cover the cost of vaccinating the entire flock. The money is used to meet various family needs including funding the education of their children and buying crucial agricultural inputs for their fields. The farmers get their chickens vaccinated four times a year, paying eight Indian Rupees (or less than 13 US cents) per bird annually. The chickens are also primed for vaccination by deworming for which they pay another eight Indian Rupees annually. Once a chicken is grown, it can be sold for a maximum of 600 Indian Rupees (US $ 9). This is a significant economic investment for the farmers. Speaking in the local Santhal dialect, Gopal’s wife Chhita (50) observes: “If you take care of your poultry, give them proper food and management, the chickens will take care of you.” She also advises others to vaccinate their birds. When the project was launched, BMPCS facilitated a discussion among stakeholders and helped them to take a bold decision to charge the farmers a basic fee, instead of handing out the vaccines for free. Initially the sales from the retail shops were low, but later the sales grew considerably. The decision has yielded good results as the farmers soon understood the benefits of vaccination. The farmers are keen to continue with vaccination even if the current project ends. This essentially points to the development of a sustainable market for ND vaccine in the district. This has also motivated several young people like Sukanti (17) to aspire to be vaccinators. “I have just finished school. I think I can be a good vaccinator and earn well,” she says. She is from a farming family with backyard poultry and hence has understood the importance of ND vaccination. 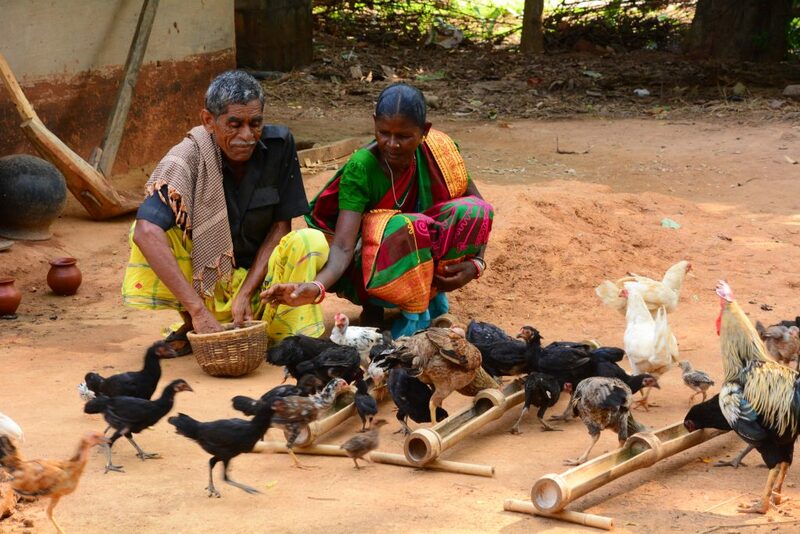 Improved income and nutrition of backyard poultry farmers have helped a large number of the population in an otherwise stressed farming situation. The region, like most other regions in India, has seen successive seasons of drought. Vaccinations against ND has boosted their poultry rearing and the vaccine now has a sustained demand in the local market place. By Deepak Bhadana and edited by Prasenjit De of Alternatives on behalf of GALVmed. Newcastle Disease (ND) vaccinators in Mayurbhanj district of Odisha state in India can today look towards bright prospects. The demand for their services has not only spawned new employment opportunities within their locales, but has also helped farmers protect their poultry flocks which would routinely be ravaged by Newcastle Disease outbreaks. 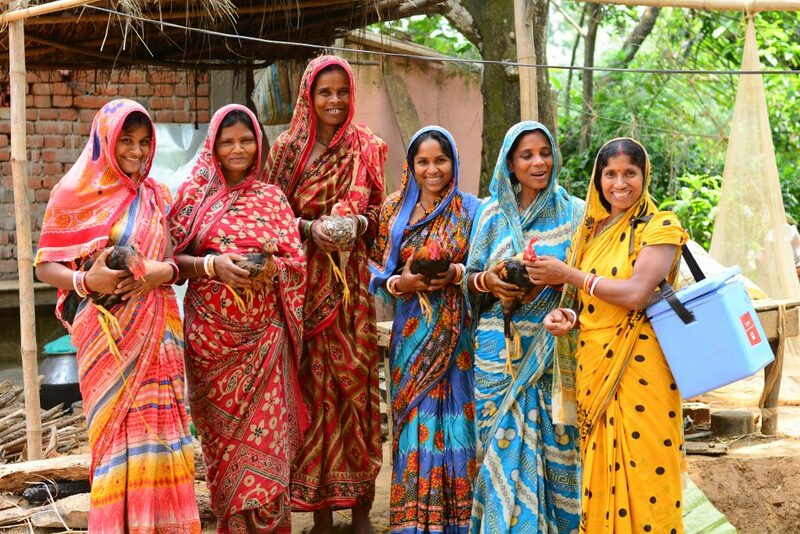 In addition, the chance to become a poultry vaccinator and the income that comes along with it has empowered rural women, who can now use their hard earned money to invest in a better future for their families. Access to ND vaccination training in Mayurbhanj district of Odisha has been facilitated by the Bhodal Milk Producers Co-operative Society (BMPCS), a local NGO, and Heifer International in partnership with non-profit Global Alliance for Livestock Veterinary Medicines (GALVmed). Thirty-seven-year-old, Govardhan Naik from Suryapada always wanted to set up his own business. A university graduate, he first heard of an opportunity to be an ND vaccinator through a friend. After a four day training course that covered vaccination and first aid, he ventured into the field as a trained vaccinator. This was about four years ago. Govardhan gets his supplies of the ND vaccine from a market at a nearby town, Kosta. He has also procured a refrigerator to store the vaccines and a motorcycle to help him reach the farmers. He serves around 400 households vaccinating close to 5,000 chickens every month. 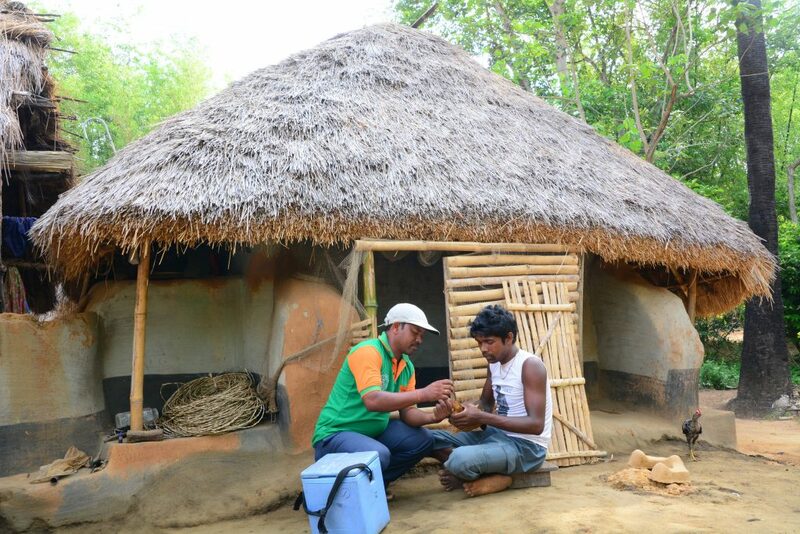 Providing additional services such as deworming and first aid, Govardhan brings home a net income averaging INR 8,000 (US $ 122) monthly, which has positively contributed to the economic well-being of his family. His work as a vaccinator has brought him recognition from the locals and several of his friends have now shown an interest in the occupation, with one of them now an active vaccinator. “I will continue as a vaccinator even after this current project ends,” he says, referring to the ongoing GALVmed sponsored initiative, much to the relief of numerous households who are grateful for his services and want him to continue. The effects of the poultry vaccinators’ work on the local economy are visible. When Govardhan first began vaccinating, an average village consisting of about 20 households would have a maximum of 70-80 chickens. After the first year of vaccination, the number skyrocketed to over 1,000. Farmers’ earnings from poultry rearing increased. “If you work as a vaccinator, you can have an independent enterprise,” he adds. A vial of the ND vaccine costs between INR 75 (US $1.16) and INR 100 (US $1.55). One vial can vaccinate up to 100 chickens. A vaccinator can charge INR 2 (US $ 0.03) per vaccination. There is also additional income derived from services such as deworming and first aid. For example, Govardhan earns another INR 3,000 or (US $46) from these additional services. The involvement of women as vaccinators has also contributed to their economic empowerment and participation in decision making within the family unit and their communities. Mamata Mandal, 42, from Tikayatpur village in Ras Gobindpur block, is one such vaccinator. Mamata first got to know about vaccination from Anup Behra, the team leader of Unnayana, a local NGO. Coming from a family that has traditionally reared poultry and having witnessed high mortality of the birds, she readily took up the occupation. Mamata procures her supplies from a small shop, about 7 km away from her village. Carrying a cool box to store the vaccines, she serves around 250 households in a 3km radius and vaccinates around 5,000 birds. Her services get her an income of INR 3,000 (US $ 46) every month. “With this income I can school my children and buy agricultural inputs for the farm,” she says. BMPCS started the programme with just 7,500 families in 2011. By December 2016, the NGO had already reached more than 175,000 households. Today BMPCS supports more than 320 vaccinators in the project area. Heifer International’s project was launched in September 2015. By May 2017, they had served as many as 62,316 households. Today, Heifer International supports more than 218 active vaccinators in the field. Newcastle disease vaccination has helped turn around the lives of many individuals in Mayurbhanj. The vaccinators stand at the frontlines in the fight against the deadly poultry disease and their services are benefitting many smallholder farmers. And with a stable demand for their services, the vaccinators can hope for a better future. A two-day workshop on Newcastle disease (ND) control in West and Central Africa brought together 38 representatives from the government and private sectors to discuss key challenges and potential interventions in the vaccine delivery and administration in the regions. The event, which ran from 29-30 June 2017 in Ouagadougou, Burkina Faso, included presentations, discussions and a field visit to Koudougou where participants met and spoke with backyard poultry farmers and vaccinators. Delegates attending the event represented the local supply chain – veterinarians, vaccinators, farmers as well as ND vaccine manufacturing companies such as MCI Sante Animale and distributors (LaProvet and their local partners CAPHAVET and CPAVI). Delegates agreed to keep coordinating their activities and sharing best practices noting that Burkina Faso is the leading country in the region in terms of vaccinating against ND. The workshop was co-organised by GALVmed and the West African Network for the Promotion of Livestock in Rural Areas (REPAC). July 6th: Today is World Zoonoses Day – a date that has particular relevance in light of the global Brucellosis Vaccine Prize, a US $30 million prize competition inviting vaccine developers to submit proposals for – and ultimately develop – a suitable vaccine for use against Brucella melitensis in small ruminants across the developing world. Brucellosis is the most common zoonotic disease globally; approximately 500,000 new human cases are reported annually, and the effects can be devastating. It is a major challenge for human and animal health in endemic countries – and one which requires a One Health solution. Can you give us an insight into why brucellosis is such a widespread issue in the developing world? I feel there are two main issues: firstly, a lack of awareness of the impact of brucellosis on livestock productivity among farmers. And secondly, brucellosis control and eradications schemes for livestock have never been prioritized by the local governments, so there has been a lack of funding for such programs in the developing world. Why do you think it is an area that has not been prioritized for funding? Brucellosis is a zoonotic disease – so in order to make it a priority for some authorities to spend money on brucellosis control programs, it is important to make the connection between the control of the disease in animals and the impact that has on the wellbeing and health of people. What are the restrictions in terms of current control programmes? For sheep and goats, the main problem is that in a developing country you will have access to the whole livestock population only once a year, and so you have to vaccinate every single animal at that point, regardless of its age and pregnancy status – which means the animal could well be pregnant when vaccinated. Drawbacks associated with the current vaccine mean that it may induce abortion at a rate of up to 100% if given to pregnant animals, so there is definitely a market need for a vaccine that is safer than those currently available. So you feel a new vaccine would be welcomed by farmers in the developing world? If the relevant authority or veterinarian is able to tell farmers in developing countries: “by using this product, you will enhance the health and the production of your animals, and it’s safe for your animals and for you”, that would make a major impact – not only in the control of the disease but also for the welfare of the people living in the community. That would be a major breakthrough. The Brucellosis Vaccine Prize competition aims to encourage animal health innovators to develop and register a vaccine that is efficacious, safe and viable for use against Brucella melitensis in small ruminants across endemic areas. Bill Gates asks: Can goats empower women?